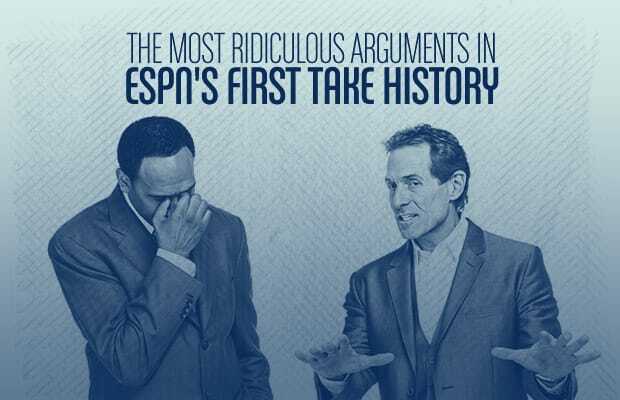 If you've never had the experience of watching ESPN's First Take, it's a show that pits two lunatics (Stephen A. Smith and Skip Bayless) against one another in an effort to recreate the types of irrational feuds common amongst drunken sports fans. Its viewership is mostly aloof soccer moms who are unable to change the treadmill TVs at L.A. Fitness. Still, somehow, it's managed to bring in ratings for over six years. During that time they've staged some ridiculous arguments. From the endless Tebowmania debates to how pitiful Skip Bayless was as a high school basketball player, here are the 15 Most Ridiculous Arguments in ESPN's First Take History.